Tech is a competitive ACC power in a number of aspects, from basketball to football to volleyball. One sport in which the school has lagged, though, is soccer. The Jackets’ Division I program is conspicuously missing. Its exclusion is a surprising one. Soccer is one of the most popular sports in the world. Professional stars such as Cristiano Ronaldo and Lionel Messi number Twitter followers in the millions and salaries far exceeding, not to mention impressive contracts. While conference rivals such as UNC dominate, there is no Tech soccer to be found at the Division I level. Neither the men or the women have a presence. 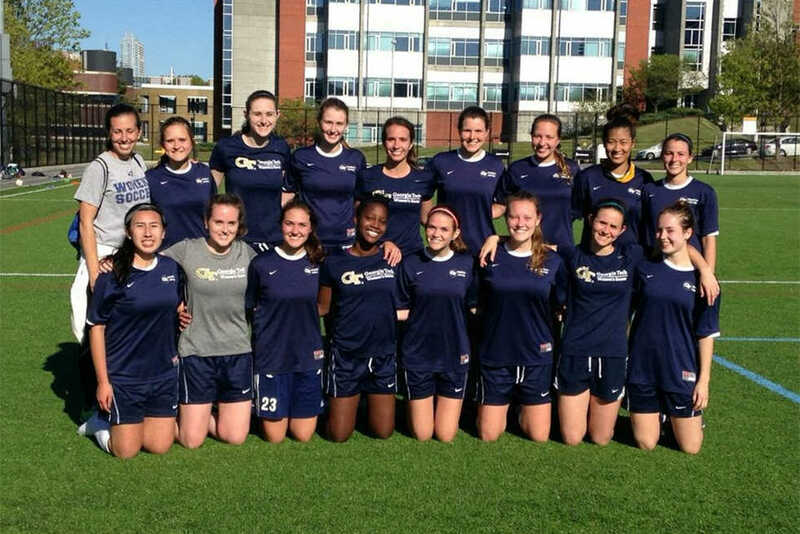 But in its stead exist strong men’s and women’s club soccer teams, comprised of talented students from around the country all sharing a passion for the sport. The latter club in particular has an interesting road ahead. The Tech club women’s soccer team is heading to the University of Florida this weekend to take part in a tournament. The team has already had two home games this season against Kennesaw State University (KSU) and Georgia College and State University (GCSU). The team emerged victorious in both games by scores of 2-0 and 3-0 respectively. Co-president Valeria Rossi was happy with the performance. The team is putting in the work to put up a strong performance throughout the rest of the season. The team has three practices per week, and players are required to make it to at least two of those practices. As a result, their experience continues to grow. However, Rossi says that the time needed isn’t necessarily an overwhelming one; each student can determine the path that suits him best and gain from his participation accordingly. Club sports offer athletes of multiple skill levels a unique opportunity. Playing Georgia will prove to be a real challenge. The Bulldogs are off to a strong 5-0-1 start, yet to drop a game and their only tie against the College of Charleston. Goalkeeper Ally Rzucidlo has only allowed a single goal so far, as opposed to the 25 they have scored over 6 matches. After their regular season is over they will head to Pensacola, Fla. from Oct. 28–30 to take part in the regional tournament, consisting of matchups with other teams in the South. Unlike most schools of its size and conference prominence, Tech will not have a soccer team representing the Institute in NCAA-sanctioned matches. But that provides its club teams a unique advantage: they bear the respect and responsibility that comes with exemplifying the best of their school’s athletic prowess in the world’s most closely-watched sport. Their aim will be a simple one: leveraging that perspective into success. Should they continue to succeed, the national tournament takes place Nov. 17–19, held in the Foley Sports Tourism Complex in Foley, Alabama. The 90,000 sq. ft. facility includes 16 fields to be used for soccer.